The San Diego Horticultural society welcomes urban farmer and landscape designer Jimmy Williams, and gardening editor and feature writer Susan Heeger, who will journey us through a 400 year Williams family history of starting vegetables, herbs, berries and fruits from seed, processing the soil, planting, tending, harvesting, preserving, and sharing the garden’s bounty with family and friends. Jimmy and Susan will share the "From Seed to Skillet" approach to gardening, which is based on the idea that gardening begins with the miracle and magic of a seed, progresses through the process of planting, tending and harvesting, and ends with the satisfactions of friends and family around a table, sharing a fresh garden meal together. Jimmy learned to garden from his grandmother, Eloise. From the age of four, Jimmy was choosing the best seedlings, and actively involved in keeping the family subsistence farm going. Today, Jimmy and his son, Logan, continue to plant seeds passed down from Eloise and her forebears, and to sell the vegetable, herb, berry and fruit tree seedlings at Los Angeles farmers' markets. Jimmy and Susan met thirteen years ago when she went to his home nursery to write a story about him for the LA Times Sunday Magazine. There, he showed me his seedling operation (on the roof of his garage), his every-square-inch-planted backyard, where even the side of his neighbor's shed gave him room for vertically growing more tomatoes, an heirloom variety that his family has raised for 400 years. Three years ago they produced an edible gardening book together. Susan earned her degree at Harvard and went on to become a long-time magazine and newspaper feature writer with a specialty in garden, design, home, lifestyle, and food stories. A contributing editor for Coastal Living and Martha Stewart Living, where she served as staff writer for several years, she also co-wrote The Gardens of California. 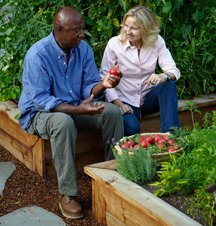 She has written extensively on edible gardening for publications ranging from The Los Angeles Times Magazine to Country Living and Body + Soul.